Last night when I was working for a test Disaster Recovery project, we had planned to recover around 100 virtual machines as part of testing the DR environment. We are not using any kind of DR automated solution such as SRM. Hence, we perform manual work for recovery such as mounting the volumes, register VMs, etc. During the recovery process I started mounting Snap volumes to recovery site. I noticed few unusual scenario which should not be in case of recovery the replicated volumes. Here are the points which made me to rethink that certainly there is some issue with some specific LUNs. 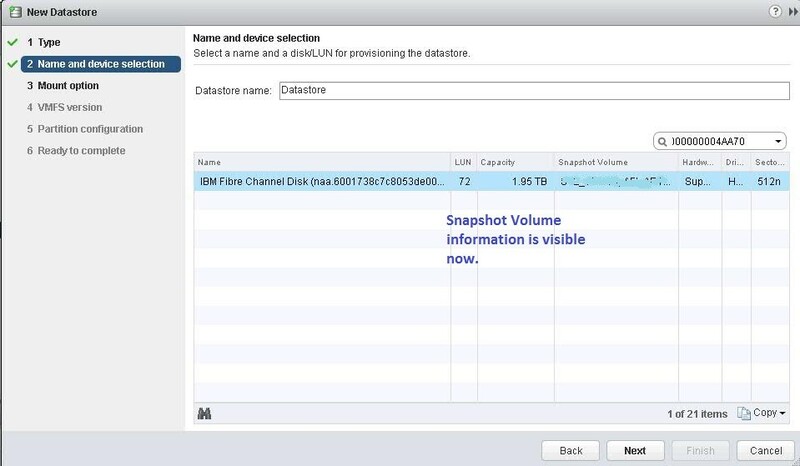 While Adding replicated datastore using Add datastore wizard, VMFS label in Snapshot Volume tab was showing blank which should not be. When I clicked Next, found that Resignation Option was not showing in few LUNs, and it was creating a datastore like a new datastore rather a replicated volumes. Datastore size was showing Zero. After suspecting this issue, I dig down to find out the solution. I followed few initial approaches to troubleshoot the issue from VMware and Storage end, still issue was unresolved. Later, I jumped to the VMFS partitioning and got to know that either VMFS partition was corrupt or not created. 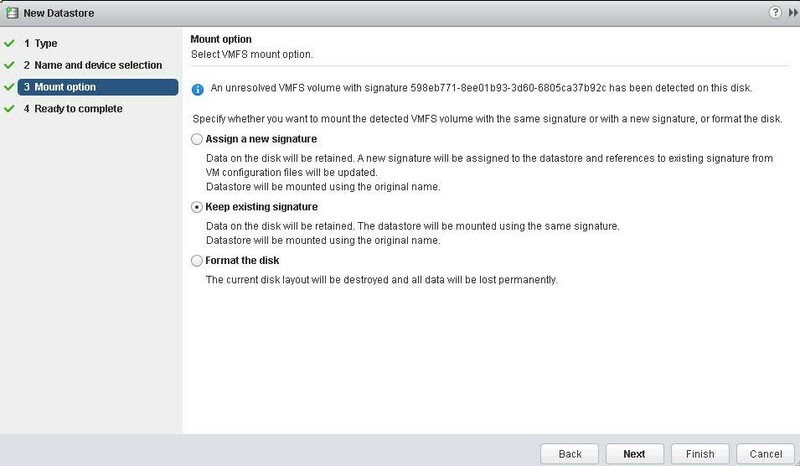 In this blog, I am going to explain the steps which I followed to recreate the VMFS partition, after which my issue was resolved and resignature option was visible. Now I was able to see replicated data in these volumes too. # partedUtil setptbl /vmfs/devices/disks/naa.6001738c7c8053de000000000004aa70 gpt "1 2048 4194303966 AA31E02A400F11DB9590000C2911D1B8 0"
Let’s take a quick insight of these commands in detail. Go to any ESXi host in the cluster on which impacted LUN is mounted. Connect to ESXi command line using Putty. Get the NAA ID of impacted LUN using any of esxcli command or vCenter GUI. Run below esxcli command to get the current status of partition table. If your partition table is already exist or not corrupt, then you will get output like below. If Partition table is corrupt, then partition blocks and information highlighted in above picture will be blank. I found only below output and third line was missing for the impacted LUNs which was clearly indicating the VMFS partition issue. Find out the Starting Block and End Block which you will use to create VMFS partition of impacted LUN. 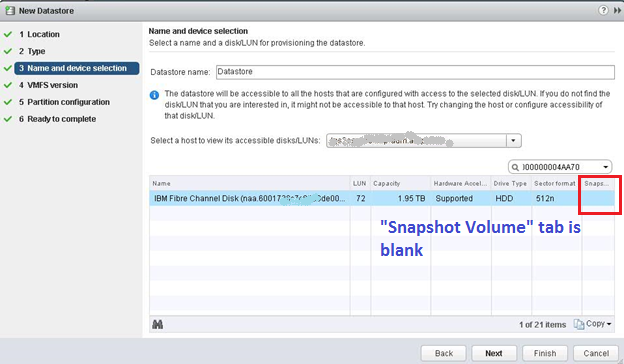 Run below command to find starting block of VMFS partition. *Note the value which is mentioned in red above “2048”. This is beginning block value which you will use to create partition of impacted volume. Run below command to find starting and end block of VMFS partition. *Note the value which is mentioned in red above “4194303966”. This is beginning block value which you will use to create partition of impacted volume. There is possibility that you may get error “Unknown partition table on disk” while executing above command. It means that you need to label the table as a GPT partition table using below command. Now again rerun below command and get End block of VMFS Partition. Note down the information from above commands which you will use to set and crate the partition. Execute Command using above information to set partition table. [root@vminsight-esxi-01:-] partedUtil setptbl /vmfs/devices/disks/naa.6001738c7c8053de000000000004aa70 gpt "1 2048 4194303966 AA31E02A400F11DB9590000C2911D1B8 0"
Now you have partition and sector information available. Bring a smile on your face and initiate add datastore wizard again. Now you will able to see Snapshot Volume information as below. Click Next to add datastore. Resignature options are also available now.